The installer will set up a search engine on an encrypted external device like usb key or external harddrive with just a few clicks. Enter a search query (may include flexible search operators) into the search field. If no search query was given, you will get an analysis of all indexed documents. Just insert or copy documents into to the directory "Documents". This directory can be opened with one click: There is an icon on your desktop. There is an option "Index for search" in the context menu of the standard file manager. After a while the content should be indexed and searchable. 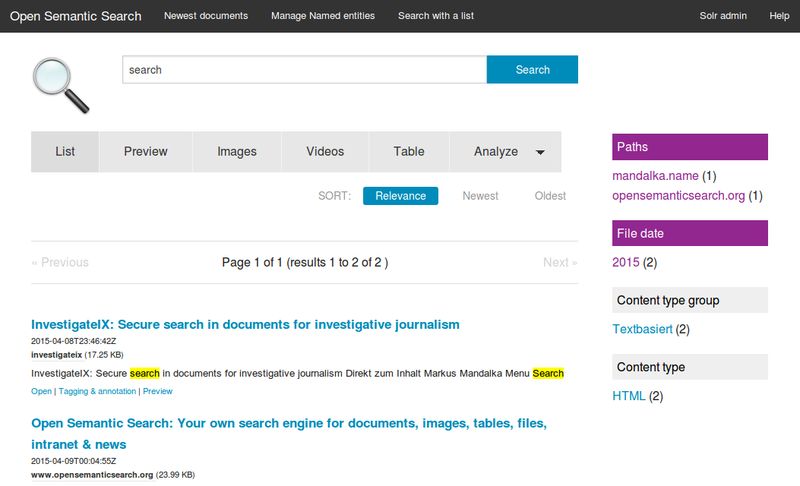 To tag a document just click on "Tagging & annotation" in the search results and add a tag or notes. 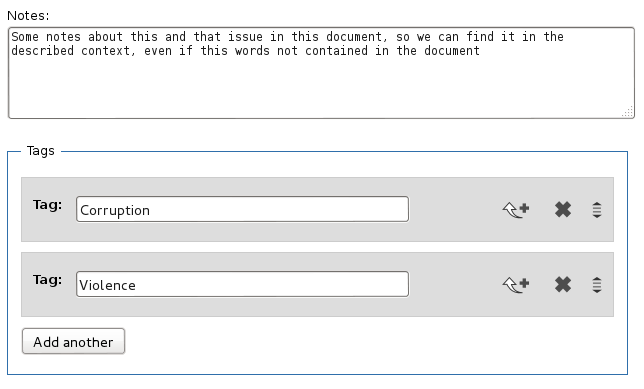 So you will be able to find this document searching this tag even if the document doesnt contain that words and you can filter by the added tags with faceted search. This is only needed, if the tag or word is not in the document like the tag "Corruption" for a document from a politician who will never write this word in this context or to tag a document with a organizations name, that is not contained in the text but the text should be found if somebody searches for the organzation. If you want to tag documents i.e. with Tags like organizations, persons or locations that are in the text, you should use Named Entity Manager which will automatically tag all documents and new documents you add in the future automatically. Just open the menu point "Manage Named Entities" in the top bar of the search and add entities like organizations, persons, locations, words or phrases. So you add this entities or names like organizations, persons or locations to overviews/facets/filters like organizations, persons or locations (exploratory search/faceted search) to get not only search results for your search query but to get for every search query / search context additionally an agregated overview of how many found documents contain this names and interactive filters (faceted search) for this entities in the sidebar. 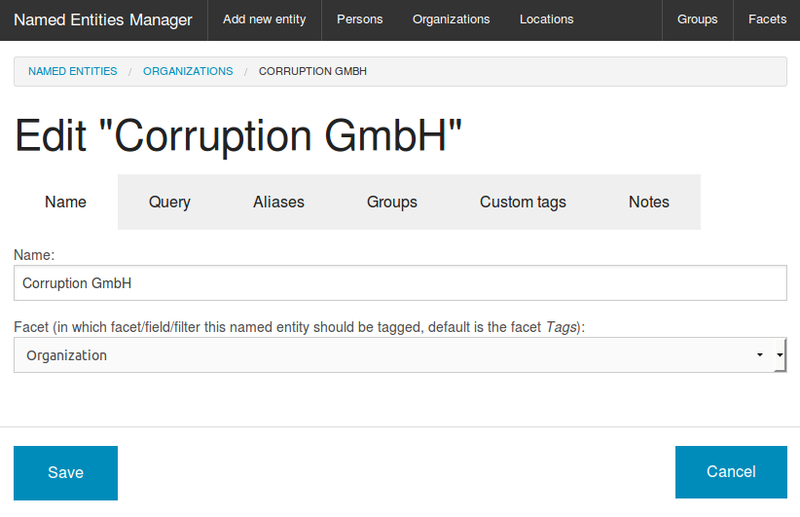 You can add entities to groups/lists: For example you can add the name/entity Mr.Money to the group Corruption-Company. So searching for something Corruption-Company you will find documents containing something even if they not contain Corruption-Company but contain Mr.Money which is in this group Corruption-Company. Additionally you can add groups to a parent group: For example you can set the parent group of Corruption-Company to Economy. So a search for something economy would find documents containing something and containing corruption-company or mr.money even if not containing the searched word economy. After adding new documents to the documents directory or indexed new files in the filemanager, click "Extract entities from new documents" on your desktop to tag or sort them with your named entities (ontology). After that you can analyze, explore, filter and visualize the data and documents.